It’s a great release physically and mentally. I love being outdoors while I train, and I’ve met a lot of wonderful people through running. My best marathon memory was at Chicago in 2010. I loved seeing crowds of people cheering for you during the whole 26.2 miles. 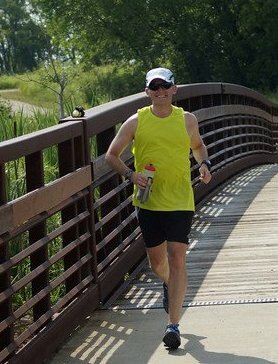 I paced an ultra runner in July through the last 34 miles at the Burning River 100 mile race. I basically ran a night run while making sure my runner was eating and drinking on a regular basis. It was a great experience to see her finish her third 100 mile race. I’m very easy-going, and promise to do my best to make sure everyone is relaxed and having fun while going through 26.2 miles. Drink at every aid station even if you are not thirsty. Fluids are crucial during a race to prevent dehydration which can affect a runner’s performance. Nothing comes to mind at the moment. I’ll have more to share at the race.